It’s been argued that only humans display truly altruistic behaviour, but now, under laboratory conditions, Michael Tomasello and colleagues at the Max Planck Institute of Evolutionary Anthropology have observed altruistic behaviour by chimpanzees towards a human experimenter, suggesting we’re not so unique after all. They’ve also observed surprising degrees of altruistic helping by 18-month old children. Three young chimpanzees were observed helping a human experimenter reach items she’d dropped or couldn’t reach. They helped without verbal prompting, training or any form of reward or punishment (see movie). However, they didn’t help when the experimenter’s needs were more complicated – for example they didn’t open the doors to a cabinet when she had her hands full. 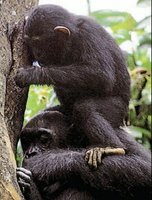 In a related study, Tomasello’s group also observed chimps letting another chimp in from an adjacent room when they needed help reaching a food platform, and that given a choice, they chose the more able chimp from two potential collaborators (see movie). “The implication is that human forms of collaboration are built on a foundation of evolutionary precursors that are present in chimpanzees and a variety of other primate species”, the researchers said. Tomasello found the altruism shown by 18-month old infants was even more extensive – they helped a researcher reach things he’d dropped but also did things like open a cabinet door so he could place books inside (see movie). Again this behaviour was observed without any verbal requests for help or any reward or praise. And importantly, the infants (and chimps) rarely helped in control conditions – for example, if the researcher deliberately threw something on the floor, or clearly intended to place books on top of the cabinet rather than inside. “Children and chimpanzees are both willing to help, but they appear to differ in their ability to interpret the other's need for help in different situations," the researchers said. The observed altruism in chimpanzees appears to contradict an earlier study that showed chimps tended not to share food with others when given the opportunity at no cost to themselves. However, Tomasello and colleagues suggest that study may not have used ideal conditions to study altruism because chimps are notoriously competitive with each other when it comes to food. Warneken, F. & Tomasello, M. (2006). Altruistic helping in human infants and young chimpanzees. Science, 311, 1301-1302. Melis, A.P., Hare, B., Tomasello, M. (2006). Chimpanzees recruit the best collaborators.Science, 311, 1297-1300.